Hello Lovelies! 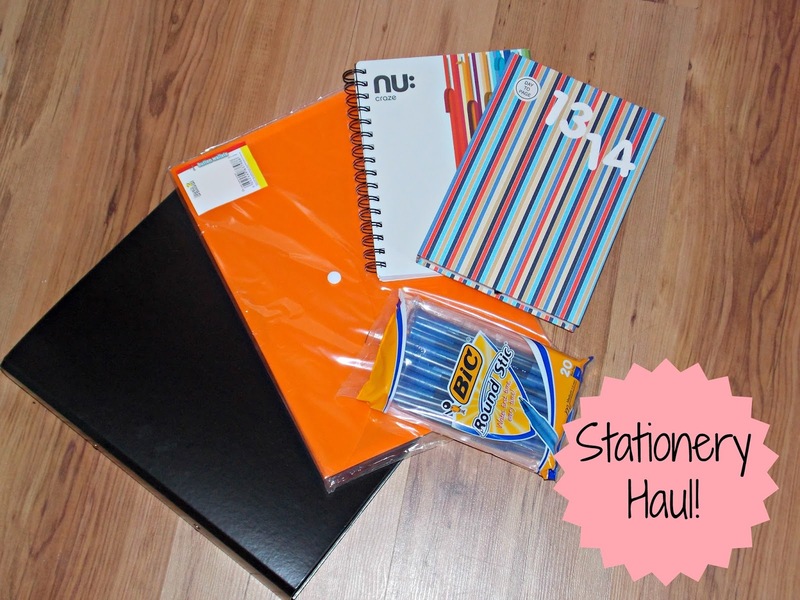 This is a last post in my back to college series, and if read the tittle it’s my stationery haul. I don’t need a lot of stationery as I am now in my second year of college and have majority of the stuff but also because other than taking notes, we do all our work on computers. The black lever arch A4 file is from Asda, like everything in this haul. We need this for a massive assignment we have at around Christmas, we print our work off and it goes in that file ready to be marked. I went for a smaller size as I simply didn’t want to carry this with me all way to college. I’ll take it with me on first day of college and it’s going to stay there, I’ve no intention on bring this back with me. If I remember correctly this file was only 80p, bargain! Next is a pack of 2 plastic folders, which are very useful to put your paper in! As it doesn’t get crumbled, damaged or lost in your bag. I went for this bright orange colour as in my opinion is a lot more fun than plain black or clear. I believe this was only £1 for 2! Next is my subject book, or simply a notebook. I prefer having subject/project book over normal notebooks or notepads as although all your notes are together, they’re dividing by subject. Therefore it’s a lot easier to find your notes when doing work as they’re a lot more organized. I also like the fact it comes with a pocket to put any spare paper or worksheet you been giving in a class. I know it will be useful if I left my orange folder at home. I think this was around £1.50 or £2.50, I don’t remember correctly but it wasn’t more than that. This year my college decide we need planners/academic diaries which I’m sure is a reason to keep us organized and to hand in our assignments in on time, instead of 2 or 3 weeks later. My local Asda didn’t have a huge choice in planners; it was either the one I got or smaller red one with hardly any space to write. I went for this one, as it’s not only nice but has a lot of writing space. The only downside is the weight, it’s really heavy and I mean it! The planner is by Collins and it was £4. Lastly is a pack of pens by BiC. These are my favourite pens ever, the only ones I like to use. They’re the round stic medium 1.0mm in blue. I don’t know about you but I prefer writing in blue rather than black… it’s very strange but true. If I have a choice I will always go for a blue. They came in a pack of 20 for £2 which is amazing as something in WH smith they can be double the price!